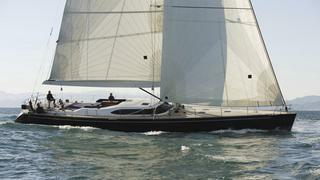 The 24 metre sailing yacht Matelot has now been sold in an in-house deal at Edmiston & Company. Constructed in GRP, she is the second yacht built by Southern Wind Shipyard in South Africa from the successful SW80 deck saloon series and was launched in 2005. She combines the naval architecture of Farr Yacht Design with the refined Italian styling of Nauta Design, who created the general concept of the project, the exterior styling and the interior design. The main saloon, surrounded by panoramic windows, is a favoured location aboard. The owner and his guests may relax sitting on the comfortable settees, enjoying the high-quality finish of the renowned Southern Wind Shipyards joinery team. Accommodation is for six guests in a master suite and two twin staterooms. The ergonomically designed guest cockpit seats six guests in total comfort. A large cockpit table contains a generous fridge ensuring ice cold drinks at any time and the entire area is positioned well clear of the working areas of the yacht so guests can relax without being disturbed. Under power, a 240hp Yanmar engine gives her a cruising speed of 9.5 knots.